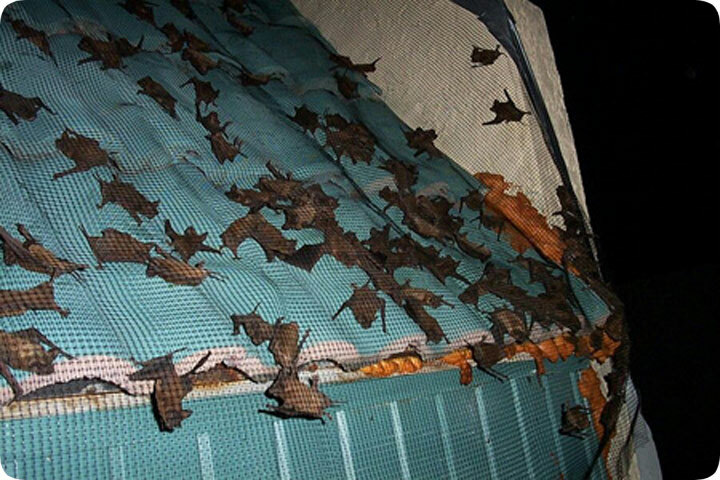 04.29.2003 - Here we see part of the process of the exclusion of a colony of bats living in a barrel tile roof. This is part of a shopping plaza in SW Florida (a town called North Port). I was called because thousands of bats had been going in and out of the roof, causing many problems. First of all, the bats were driving away customers - not only at dusk, when active, but also during the day, due to the noise and especially, the odor. Bats have a very strong odor - both from their droppings and urine, and from their own bodies. A large colony can give off quite a strong odor. In this case, the bats were not just living under the tile. They were entering the attic via gaps in the roof plywood. I found the colony roosting in the attic, and they left piles of droppings, some about a foot deep. This is unsanitary, offensive to smell, and a biohazard, unfit for any dwelling, let alone a public space. The first step in the process is the removal of all of the bats. It must be done in a careful and humane manner. It is illegal to kill a colony of bats, but more importantly than that, it's just plain wrong. Bats are valuable animals. They also live for a long time. I've read varying accounts, citing ages up to 18 years, with an average of a ten year life span per bat. In a group like this, of a thousand bats, killing the colony could feasibly mean killing ten thousand years' worth of insect-munching and fascinating animals. Why would anyone kill bats? It's just not necessary. After all of the bats are properly removed, the building must be completely, 100% sealed. You can see in the photo above some sort of orange gunk around some of the tiles. That is not my work. That was some amateur who tried to seal some areas shut using a can of Great-Stuff foam. It's a good thing this person did a crummy job and didn't seal any bats in. After all the bats were removed and the building sealed, that's when the cleanup began. I vacuumed out all of the bat droppings and fully decontaminated and deodorized the attic. Problem solved! Why did the bats choose to live in this building? The answer is that it met their needs - it was tall enough to allow free entrance and exit, obstruction-free, and featured small gaps - bats instinctively enter small gaps, usually of about a half-inch in width, because they know that they will be safe from larger predators within. Furthermore, the roost met the bats' requirements for proper temperature and humidity. Free-tailed bats, like the ones living in this roof and featured in the above photo, like very warm temperatures, sometimes up to 150 degrees. It gets very hot under those tiles of course. Well, I forced them to find a new home. They'll be fine, as will the customers and tenants of the now bat-free shopping plaza.